Blog - The Secret Is Out! We've heard rumblings about a new coin from up north, but at long last, the details are out! 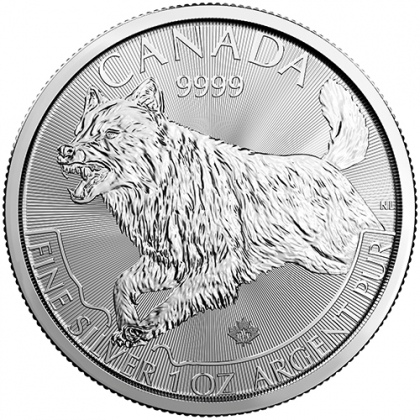 The Royal Canadian Mint just announced the release of an all-new 2018 1 Oz Silver Wolf coin. This piece is the third edition in the immensely popular Predator series, which began with the 2016 Cougar and the 2017 Lynx. Now this intriguing product line continues with another fierce creature of the Canadian wildlife: the wolf. Like all 2018 RCM silver coins, the Wolf boasts some outstanding features. First and foremost, it's one of the most attractive bullion coins of 2018. The creature is meticulously engraved with a stunning level of precision and detail. You'll be impressed by the masterful artistry that went into designing the coin. Furthermore, the 2018 Wolf offers all the benefits of a 2018 Silver Maple. It's struck in .9999 pure silver, features intricate micro-engraved radial lines, includes a laser-etched watermark for security, and incorporates all-new MintShield technology. The net result is a coin that's as secure as it is beautiful. The Wolf may have all the "bells and whistles" of the 2018 Silver Maple, but there's one big difference: mintage. Whereas RCM can make an unlimited number of standard-issue 2018 Silver Maples, the 2018 Silver Wolf is capped at 300,000 coins worldwide. This means that this coin has the potential to become a scarce and coveted collectible. We're offering this brand-new coin at special launch pricing. Today, you can lock in 2018 Canada 1 Oz Silver Wolf coins for as little as $2.34 over spot. At these low premiums, you're essentially buying a numismatic coin at a wholesale bullion price! Whether you want to expand your collection or own investment-grade silver in a beautiful form, take advantage of today's low premiums. Reserve your spot at the head of the line -- and grab a truly stunning piece of numismatic artistry!